“Total War?” No, thanks. “Hearts of Iron?” Absolutely not. “Arma?” Not even close. 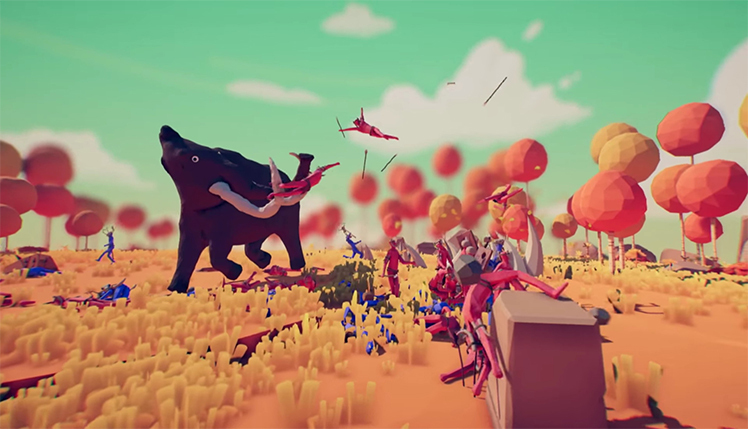 No, none of those compare to the realism and strategy involved in “Totally Accurate Battle Simulator.” Released for early access on April 1, 2019, by Landfall Games, “TABS” is a strategy game simulating a battle and using its physics engine to determine the outcome of a fight. With a variety of units and, theoretically, limitless situations to pit your fighters in, “TABS” provides a fresh take on the cruel realism of war. Because nothing says “realistic” more than saying it is in the title. The gameplay of “TABS” is simple. Almost too simple. In campaign mode, players are limited by a set budget for whatever units you field. It is a tried and tested way of balancing certain units, although it is not a perfect system either. Regardless, the challenge in these battles involve making sure players have the right units for the job. And while spamming one certain unit may prove effective, as the levels progress in campaigns, the player is encouraged more into using mixed unit compositions for an entertaining setup phase. Problems arise once the actual battle starts, though. The AI is not the brightest, and while that is fine on paper, the player is not given any ways of manually ordering their units in a fight. If their cavalry is caught up in the mosh pit in the center, and ignoring the enemy’s squishy backline, there is nothing the player can do to change this. Is part of the player’s line collapsing, and the enemy is attacking their backline? Nobody is going to come to the rescue. Trial and error may help, but so does rolling a die over and over until one gets their number. It makes sense that the most realistic simulator around does not let you possess your army, but it also leads to unnecessary frustration on the player’s part. But even when players are pulling their hair out over their army’s stupidity; one can at least have a chuckle over the presentation of the battle. All the units in “TABS” are given distinct features that stand out on the battlefield, from a squire’s crusading outfit to a halfling’s “Lord of the Rings” style to a berserker’s hairy armpits. The physics engine itself is a mixed bag when it comes to combat, but also creates a fight that is more than number crunching, and absolutely nothing beats watching individual bodies fly from. Fielding too many units at once is likely to kill one’s pc, but it is worth it. Thankfully, the issues that have been raised can be set aside for the fact that Landfall Games does not consider an early-access game to be a finished product. There have been regular updates and news on development of “TABS” since release, and new features and content are going to be introduced later that fix the current problems in the game. Confirmed upcoming releases include two new factions, Asians and Renaissance, as well as a unit possession function. While “Totally Accurate Battle Simulator” may not be worth its $15 price tag as of now, one only needs to give the game a little more time before it is truly accurate.